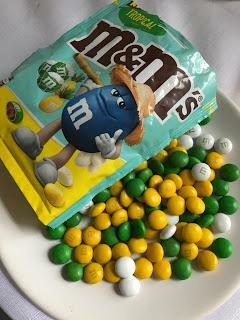 Today's review is rather special, because M&M's are one of those products that when they do a new flavour...well, it's always an occasion! And these ones are all the way from Australia - I was kindly sent a pack to try as part of a snacks haul recently, and am ever so greatful. It seems that Australia are getting many different varieties of M&M's recently - from these to Hot Cross Bun and now they're even getting Strawberries & Cream too! WHY do we never get such flavours in the UK? It's a travesty! 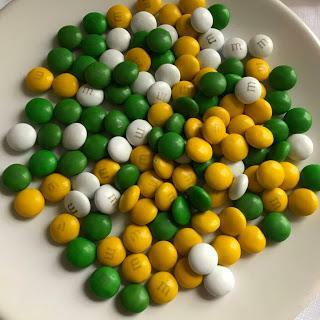 Moving on, these M&Ms come in three colours and flavours, they're green, white and yellow with the white being coconut flavoured, the yellow being pineapple and the green? I'm not sure actually - it was rather difficult to detect. Apparently according to Twitter it's regular milk chocolate. They certainly have a strong pina colada type aroma, and the wrapper suggests this also. I tried them all individually before mixing them together. The white one has a strong, albeit artificial coconut taste. Sweet and sickly...not sure I liked it to be honest, I think I'd have preferred white chocolate combined with coconut. It doesn't quite blend with the milk chocolate (but then I never much liked the Coconut M&M's I've tried in the past either). 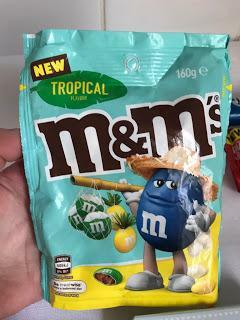 The pineapple is interesting...a bit like if tropical Starburst Chews had accidentally got mixed with M&Ms in the factory. It's fun in a novelty sort of way. The green...it just tasted of chocolate. Crunching on a handful of them all together they definitely give a strong Pina Colada like flavour, which is in equal parts sickly and equal parts kind of fun. I think kids would love these...but adults might only want a small handful. Overall, I have mixed feelings on these M&M's. They're certainly fun and interesting, but not something I think will stay around permanently. They would probably work better with white chocolate as I feel it just goes better with fruity flavours. Now, I do think that Hot Cross Bun flavour will work better with milk chocolate...so we shall see how those ones are!